The 5 a day rule for fruits and vegetables servings has been thrown out and replaced with 7-13 cups of produce daily to receive all the health benefits our bodies need today. Research shows that over 80% of Americans fall short of achieving the past 5 servings a day recommendation which has become a serious health concern. Consuming the highest quality whole food fruit and vegetable enzyme rich supplement can act as an insurance policy to make sure you get the nutrition your body deserves on a daily basis. 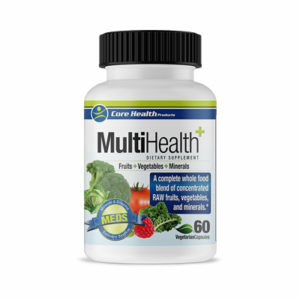 MultiHealth provides a balanced formulation of 22 RAW whole foods combined with natural phytonutrients to help you meet the recommended daily nutritional values. This unique formula provides a balance of patented amino acid chelated minerals combined with potent levels of all the whole food vitamins needed to sustain good health. This product features VitaBerry and VitaVeggie as part of the proprietary whole food nutrient blend. These unique blends use proprietary freezedrying technology to ensure that the natural nutrients in these fruits and vegetables are maintained.